According to Forrester Research, employees are 75% more likely to watch a video than read documents, emails or web articles. This is an outcome of evolution, whereby imagery is processed much more readily than text. Think about it, we have cave paintings dating back 50,000 years, while the oldest writing is only 5,000 years old. By incorporating moving images, visual cues and animation we reinforce the content being communicated and can highlight key learnings, maximising recall and retention of information. 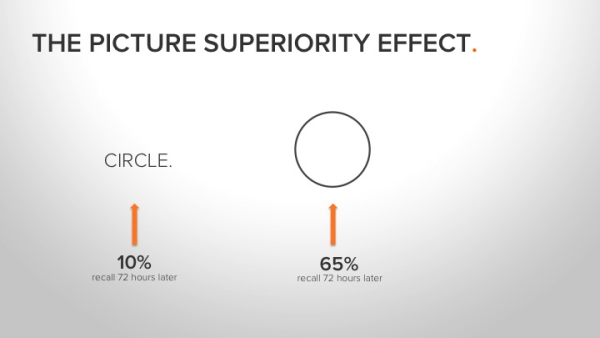 The Picture Superiority Effect clearly illustrates that words supported by images improve information retention by 650%, when compared solely to words. Video enables self-paced, learner focused instruction. Unlike live presentations, videos can be paused and replayed, allowing the learner to reflect on material or to carry out further research on concepts, at a speed that suits them. Learners can access training videos on-demand – at the time and place where they require the instruction. Video is an affordable method for delivery of training. Cost is a commonly perceived barrier to using video for corporate learning. Today the cost per view associated with producing video content is far less compared to traditional trainer based classroom models. The savings are even greater if there’s a large number of staff to train, or if they are dispersed across multiple locations, requiring travel for trainers and access to physical venues. With video, a centralised message can be created and utilised over a broad geographic area and over a long period of time. Further, updates to video content can be more flexible and affordable than the cost of updating traditional collateral and physically sending trainers out onsite. How can I incorporate video into my organisation’s training program? Watch the case study for how ANZ successfully used video to roll out their software training or talk to Burninghouse today about delivering your corporate training programs using video.